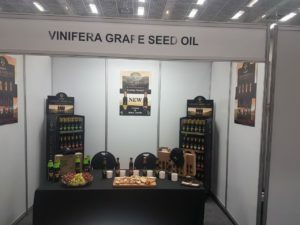 Seed Oil SA exhibited at the Spar Trade Show 2017, which was held at the Cape Town International Convention Center on 16 August 2017. This is an annual event on the calendar for the Spar Western Cape Region where Spar owners and buyers come together to look at new products or potential suppliers. The Spar Western Cape Regional Head Office sends invitations to selected suppliers, which is the only way suppliers can exhibit there. We were very honored to have received such an invitation and made full use of this opportunity to showcase our Cold-Pressed Grape Seed Cooking Oil range. 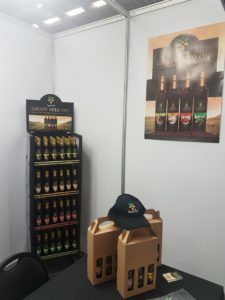 It is important for us to display at such an event as consumers are then, through our partnership with Spar, able to see what is new on offer. They can also purchase the product for healthier cooking. On display at the Spar Show we had our Grape Seed Cooking Oil in different flavours i.e. Natural, Chilli, Garlic and Rosemary. We also took the opportunity to launch our two new flavours Lemon and Black Truffle. Spar visitors to the show were able to taste all the oils on display and able to place their orders at our booth. Este van Dyk, Marketing & Sales Executive at Seed Oil SA, was on hand to interact with visitors at our booth. She was answering questions and promoting our products to the Spar owners. Some gift packs and samples was handed to visitors at our booth. This was really a great way to connect with all the visitors and to start building relationships with the different Spar owners/buyers. Spar owners/buyers from Namibia also attended the Trade Show, as they are part of the Spar Western Cape Regional Office. The response from visitors on the show was great and lots of interest shown for our Grape Seed Cooking Oil. This was a show well worth exhibiting at and we were connected to the right people who attended the show. We would like to thank Spar Western Cape Regional Head Office for the invite. It certainly was an honor to have been invited and believe that great business was done and good relations built on this show.